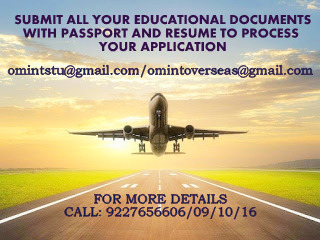 OM VISA Consultancy - Global Immigration, Students, Visitor, Business & Work VISA Consultants: Get the opportunity to study in france with IELTS 5.5 band and make your dreams come true with the help of Om International the leading visa consultancy. Get the opportunity to study in france with IELTS 5.5 band and make your dreams come true with the help of Om International the leading visa consultancy. 4) Master's in Digital Marketing - (its an Exchange Program; student has to complete first Semester in Pune College later whole batch will fly together to College De Paris. English test results: IELTS (5.5), TOEFL (70) or TOEIC (750) Tuition fees: 10,000 euros + 290 euros (non-refundable) administration fees + 215 € (for French social security payable on arrival). As soon we receive all documents, after verification, within a week telephonic round of interview will be scheduled and later within a week Conditional Offer Letter will be issued. After getting offer letter student has to pay complete fees through Bank transfer to the College account i.e 10000 euros tuition fees and 290 euros administrative cost within a month. Once you forward me the Loan Approval letter and Payment Receipt i.e T.T Copy of complete fees payment of the student; then I will forward you Campus France forms and Links. You have to share student User Id and Password so that we may verify Campus France and suggest you if there's any correction before submit. You will receive courier of all these documents within 15-20 working days from the day his Loan Approval letter and Payment Receipt i.e T.T Copy has been forwarded to us. Student has to visit Campus France for personal interview. And lastly after receiving NOC from Campus France student has to visit VFS. We will assist you for each and every step. Please call or mail when you are free. Please feel free to call me any moment and clear all your doubts.